Business premises on the High Street, vacant as of June 2018. 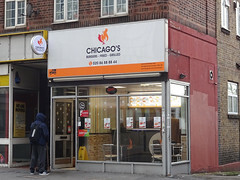 It was previously occupied by a chicken, burger, and kebab shop called Chicago's, but this closed down some time between March 2017 and June 2018. According to a photo on Flickr, at some point in the past the premises were occupied by a Chinese restaurant called Fung (something). By July 2012 it was a kebab shop called Premier Kebab photo. This closed some time between February 2013 and February 2015. In February 2015 a fried chicken shop called Wing O'Chicken opened photo, also offering burgers, kebabs, and pizza, but this closed down some time between April and December of the same year, probably by August. It was vacant as of December 2015, and still vacant as of September 2016. A chicken, burger, and kebab shop called Chicago's photo opened some time between September 2016 and January 2017. This did takeaway and delivery, and also had a couple of seats for eat-in. It closed down again some time between March 2017 and June 2018. Last edited 2019-02-07 16:15:39 (version 32; diff). List all versions. Page last edited 2019-02-07 16:15:39 (version 32).